Our Red Bank, NJ cosmetic dentistry practice offers plenty of teeth whitening options. While in-office care is effective, we also offer take-home whitening for some patients. Professional at-home dental bleaching systems can be used either alone or as a supplement to in-office teeth whitening treatments. These systems vary in terms of how they operate, but they generally involve patients wearing a tray with a bleaching agent inside of it, which helps bleach the outer layers of the teeth. At our practice, we offer DayWhite® at-home teeth whitening. Let's go over some of the basics of DayWhite® teeth whitening and how it can benefit patients. How Does DayWhite® Compare to OTC Bleaching Products? DayWhite® teeth whitening is far more effective and powerful than the teeth whitening products you can purchase over-the-counter. While OTC tray systems can yield good results, DayWhite® achieves these results much faster than even the most advanced consumer-grade whitening products. The secret is the bleaching agent used in the DayWhite®. This bleaching agent is very strong, and allows great results to be achieved in just a manner of weeks. Since there is some professional monitoring and input from your dentist, this helps improve the overall whitening results that DayWhite® can achieve. How Does DayWhite® Compare to In-Office Teeth Whitening? While DayWhite® at-home whitening is powerful, it is not as strong or as fast as in-office teeth whitening. When in-office teeth whitening is performed, a dentist gets to use the most state-of-the-art technology available to safely unlock additional properties of a dental bleaching agent. This type of whitening is not made available to consumers since training and dental care expertise is necessary to perform the procedure safely. For example, our office uses Zoom!® teeth whitening for in-office bleaching procedures. A special light is used to activate the bleaching properties of the whitening gel. Such a system simply would not be feasible in a take-home form given. It's not unheard of for dentists to combine in-office teeth whitening with take-home teeth whitening kits. This may be done for major tooth discoloration and dental stains that a single in-office bleaching session will not be able to address. 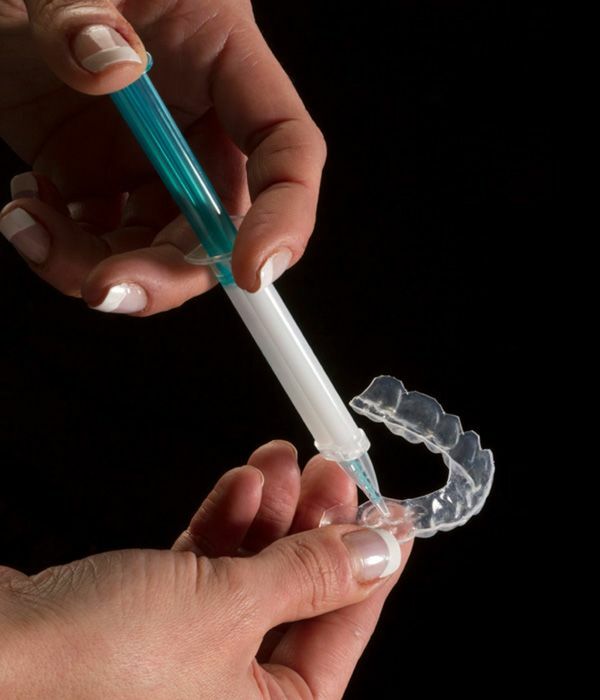 Typically, at-home kits are given to patients after first undergoing an in-office procedure. That said, dentists must be careful about combining in-office and at-home treatments. Patients may suffer from serious tooth sensitivity if they try to rush through their at-home treatments or if they initiate at-home care too soon after a professional in-office procedure. With all of this in mind, DayWhite® teeth whitening patients need to follow all instructions very carefully. This will help minimize tooth sensitivity and discomfort and maximize the benefits of care. Whitening trays should only be worn as directed and only for the duration specified. Follow-up visits with your dentist will occur periodically to monitor progress and determine when the at-home whitening treatments should cease. Attend these follow-up visits as scheduled. For more information about teeth whitening and how it can improve the appearance of your smile, be sure to contact an experienced cosmetic and restorative dentist today. The team at Michael Bixby Center for Advanced Dentistry will determine the ideal treatment option to help you get the smile you have always wanted.